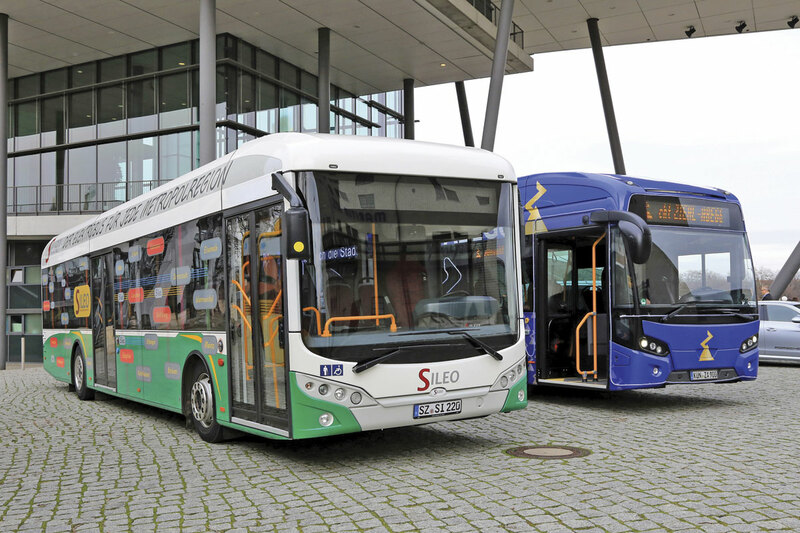 Back in 2013, the second SAENA (Saechsische Energieagentur) conference in Dresden focussed on the performance of hybrid diesel-electric vehicles and looked at development work towards the introduction of full electric urban bus systems. For 2015, the conference heard how some of these had been realised and learnt of the many challenges that have been overcome on the way or, in some cases, have stalled their implementation. Around 200 participants gathered in Dresden’s ICC for the two day event featuring 26 speakers covering a whole spectrum of topics impacting on electromobility from politics through research, development and construction to operations and sustainability. There was much to take in and although the presentations covered mainly German activities, much of the learning and technical innovation has an international impact as the world drives towards reducing the impact of transportation emissions on global climate change. That the COP21 summit was taking place in Paris at the same time was not lost on delegates. Welcoming guests, Christian Miksch was pleased to report how far electric bus projects had progressed since the first conference which was aimed at supporting the introduction of small fleets of hybrid vehicles in Leipzig and Dresden. He was followed by keynote speeches setting out the case for alternative vehicle fuels from German regional and national government perspectives. Alongside electrifying public transport, other current objectives included a nationwide network of 24 hydrogen fuel stations and rapid chargers (7-15 minutes) for electric vehicles in motorway service areas. SAENA’s role covers the support of a wide range of projects across Sachsen and on a wider basis as part of a co-operation between the states of Sachsen and Bayern. Electrification of vehicles was a key element alongside making their use more efficient with projects such as optimum routing in Dresden and considering the impact of growing numbers of electric vehicles being allowed to use bus lanes. Trains and street cleaners also feature although trials with an initial electric version of the latter were halted when it proved too powerful and removed the sand from between the paving around Dresden’s restored Frauenkirche. LVB’s experiences with its fleet of 19 hybrid vehicles from four manufacturers has been mixed with all showing less fuel savings than expected and two of the serial hybrid types not benefiting from control of when and where the diesel engine was running. The technology worked however, the buses were noticeable to passengers, provided a good image for the company and were expected to run for their planned ten to 12 year service life. The two high profile full electric operations being planned in 2013 to provide a complete electric transport system in the neighbouring town of Markkleeberg alongside the new S-bahn electric railway proved difficult to deliver politically (Markkleeberg comes within the Leipzig Land administration rather than Leipzig City and most bus services in the town were taken over by the Land’s own operator PVM in 2014). Both projects were therefore refocused to routes within the city although only one of them will be physically delivered within the timescale of the available funding. Project ‘Batterfly’ now focuses on route 89 serving the heart of the city centre and will involve two electric buses with charging at the outer terminus from 2016. Ronald Juhrs believes that electrification changes peoples’ attitude to public transport, particularly young people who were ‘connected’. LVB has supported the latter with the Leipzigmobil app which compares the prices of a wide range of transport facilities and centrally manages payment for them. Project ‘Skorpio’ which foresaw trolleybus style vehicles with partial overhead systems for recharging has become a modelling project in association with the Fraunhofer Institute after consideration of the shortest city route operated by articulated vehicles showed a requirement for nine vehicles and 50% of the route to be overhead wired. The modelling will support the work on automatic polling systems (referred to later) and the potential to convert a significant number of the city’s standard single routes, mainly short tramway feeders, to full electric operation in 2019. Two thirds of Dresden’s public transport is electric although the importance of having some diesel vehicles was highlighted when the city flooded in 2002 and electric trams were unable to operate. 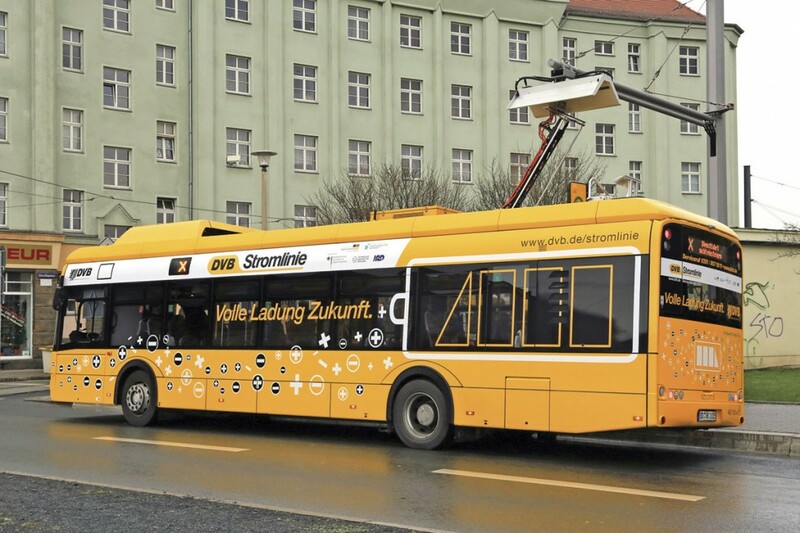 DVB successfully introduced a 5.2km full electric bus route during 2015. The 79 is operated by a 12m Solaris electric bus opportunity charged at the inner terminus where passengers transfer to the tram network. The route’s 20 minute frequency and 16 minute running time allow a window of four minutes for charging at 200kw. ¤1.14m has been invested in the project including ¤190,000 for the charging system, ¤480,000 for the bus and an additional ¤300,000 for the Lithium Iron Phosphate battery that was procured by Dresden’s Technical University. Robert was clear that there wasn’t a commercial case on this basis. A further ¤70,000 has been invested in bus stop infrastructure to support the alignment of the vehicle for satisfactory automatic connection to the overhead mast. This includes approach kerbing and differential surfacing on the pavement to mark the stopping position. Attention paid to this aspect has been rewarded with only one fail in over 3,000 recharge events and this is attributed to driver error. Despite the multitude of tramway poles in the area, DVB experienced some planning difficulties with the charging pole and its attendant Schunk connection system. Power was available locally from the tramway system but needed an additional transformer to cope with the voltage swings caused by tram operation. The weight of the vehicle restricts its capacity to 70 and electric consumption of 1.3kwh/km in summer has risen to 1.9kwh/km with heating in winter conditions requiring further development work to optimise battery life. Looking to the future, Dresden is looking at what other routes could be electrified from 2019 onwards and working with the Technical University to develop lighter weight components for its electric and hybrid buses. An opening comment of ‘never underestimate the difficulties of installing fast charging systems at termini,’ summed up the experiences of many of the presenters throughout the conference. Research at Fraunhofer had shown that over 50% of vehicle duties at 12 major operators could be covered by an overnight charged electric bus with a range up to 200km. Fast charging was therefore needed for the remainder despite its problems. 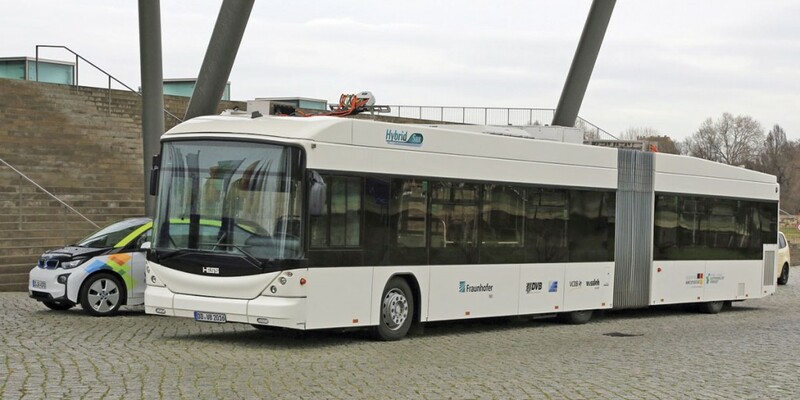 Following on from the ‘longest bus in the world’, a hybrid demonstrated at the 2013 conference, Fraunhofer now had EDDA, a 12m full electric demonstration 250kW fast charge vehicle equipped with the Schunk overhead pantograph system, Hoppecke batteries and Vossloh Kiepe power electrics. Converted from a prototype Goeppel hybrid vehicle, tests have shown a consumption of 1.19kwh/km on parts of Dresden’s route 61 and 95% efficiency from network to battery. Tests have also revealed that the optimum pantograph position should be on the offside of the vehicle forward of the centre doors and that careful attention needs to be paid to noise from components such as steering pumps which are normally masked by diesel engines. The BeSystO project from VCDB is looking at the optimal solution for urban transport electrification based on what current technological progress could deliver. This was demonstrated by the example of a 12km city route which required ten 18m articulated vehicles. At present, a single overnight recharge solution would not deliver, opportunity charging with alternative saloon heating is marginally possible but with a vehicle capacity limitation leaving only the partial trolleybus option to provide full capacity and full electric heating or cooling including at termini. VDV reports that 30 German operators have plans for around for 550 electric vehicles and the organisation has working groups looking to develop standards. However, to reduce CO2 emissions by 40% by 2020 (compared with 1990), VDV operators would need around 17,000 electric vehicles, about half of their current vehicle parc. Current German financial regimes would need significant change to promote a transition to electric vehicles. Perhaps surprising were figures that revealed the impact of various forms of taxation on electricity and its systems meant the German government took 45.99cents per km from electric vehicles and only 16.65cents per km from diesels. Andreas referred to successful Siemens’ projects in Hamburg, Stockholm, Gothenburg, Stuttgart Airport and Vienna. The company provided a range of charging methodologies including top-down pantographs, twin overhead wire and plug-in. A Vienna vehicle was regularly used for demonstrations elsewhere although the fleet there proved so reliable that it was not missed. Recharging of it was simple in cities where trolleybuses were already in use although care had to be taken as in some locations the overhead wire polarity was reversed. Experience had showed that regular battery balancing was essential on opportunity charged vehicles to ensure optimum operation. In addition to the removal of energy losses and noise associated with drive line components, hub drive motors have the benefit of different electrical design parameters. Sascha’s presentation covered the optimum design to minimise power losses from the copper elements on motors whose speeds did not reach the level where losses from the iron elements became significant. Tests on the latest ZA Wheel installation had shown electric consumption averaging 0.84kwh/km between June and October, it was also shown to be between 8dBA and 16dBA quieter than a current Euro6 diesel bus particularly on take off. Above 30kmh, tyre noise was now the most significant consideration. The latest design of hub motor was particularly effective at recuperative braking and limitations had needed to be applied to keep this within the comfort zone of passengers under normal operating conditions. There was a potential for variation in hub motor design to suit the planned route topography and thus minimise weight. 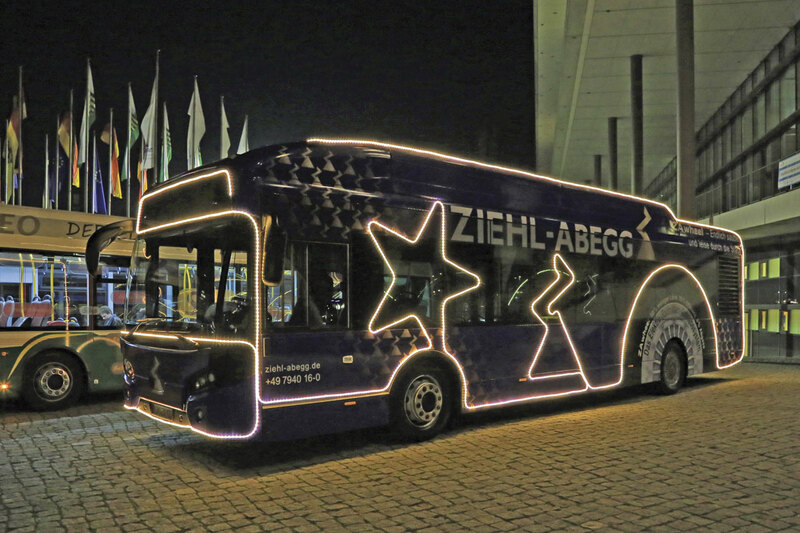 The presentation closed with details of Ziehl-Abegg’s retrofit programme which was reported on extensively in Bus and Coach Buyer’s Busworld 2015 report. The Technical University in Dresden is involved in a variety of projects to support the efficient operation of electric and hybrid buses. Examples presented to the conference were optimisation of battery charging on Dresden’s route 79 to maximise battery life and increasing the efficiency of the Mercedes-Benz Citaro hybrids on route 64 through improved heating control and lightweight components. Monitoring of the electric bus on route 79 had shown significant differences in the use of opportunity charging by drivers, some charging on every trip with others leaving charging until the battery was significantly depleted. The TU have used the data to simulate the long term impact on battery life, determine an optimum charge level band when opportunity charging should take place and support the development of drivers in its use. One of the Citaro hybrids was equipped with twelve sensors to monitor interior temperatures across the vehicle and record the impact of activities such as opening doors. The results have supported the development of a more efficient system which makes use of a heat pump, waste heat recovery and a hot air curtain in the doorways when doors are open. 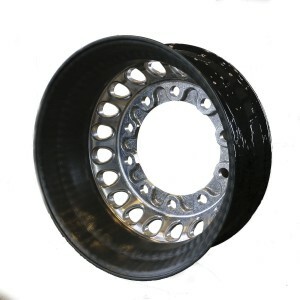 Whilst the use of alloy wheels has a significant effect on vehicle weight, researchers at the TU have identified that a further significant reduction can be achieved through the use of carbon fibre. Both full and composite designs were investigated to develop an optimum balance of weight, cost and ease of manufacture. The chosen design now at prototype stage consists of an alloy face and carbon fibre rim completed in a newly patented process. The prototypes will be subjected to a four million cycle static test followed by rolling road and test track trials before progressing to an operational vehicle. M&P first developed a charging station for Fraunhofer’s Autotram project in 2006 and Stefan gave a highly technical presentation which included alternative current or voltage control systems and the necessary safety control systems. Automatic polling systems for trolleybuses were first considered in the 1970s with the introduction of duo-buses in Esslingen but not finalised. The proposed Skorpio project in Leipzig demonstrated a requirement for wired sections to limit battery sizes and hence maximise capacity. Wiring would be omitted at critical aesthetic locations and where expensive overhead junctions were required so automated polling systems would be essential. Dr Thain demonstrated the potential impact of opportunity charging by comparing the energy transfer rates for diesel and electric vehicles. Filling a diesel tank represented 27MW, the equivalent of nine wind turbines at full production. Filling station capacity across Germany was around 2268GW and he estimated that the electric fast charging equivalent to replace it would be around 500GW or nearly three times the country’s currently installed electric generation capacity! In terms of total energy production, he estimated that only 165TWh would be needed for full electric operation compared with a total production of 614TWh thus making it practicable providing vehicles were charged overnight or run ‘on wire’. Development of the automatic polling system has reached the stage of a lorry based test rig being successfully demonstrated in Eberswalde during November. The target is to achieve a stable system which operates safely without driver intervention when the vehicle is stationary. On the move polling presents a significantly harder challenge due to the current design standards for twin overhead wire systems. With connectivity in all forms now at the heart of daily life, Lars looked at the potential for further connectivity in the transport field to achieve the objectives of saving lives, reducing CO2 and supporting lifestyles. He referred to both Vehicle-Vehicle systems such as lorry platooning in Hamburg port and Vehicle-Individual systems such as automated calling from a vehicle involved in an accident. Most such systems only worked when their installation had reached a critical mass and there was a continual challenge to protect them from hackers. The Bozankaya Sileo project concept is based on a lightweight vehicle with maximum capacity for passengers and batteries capable of achieving a guaranteed 200km operational range on a single overnight charge. Safety of the electrical system is a key factor in the design with all batteries outside of the passenger compartment, automatic battery system shutdown if certain critical values are exceeded and only low voltage systems in vehicle inspection zones. High voltages are confined to the roof areas and the cabling to the motors. Energy use is minimised through optimised ancillaries, recuperative braking with EBS and active battery management. The SCL battery system consists of numbers of individual cells with any one replaceable in the event of failure. Charging from the specific Sileo charging system takes place in two stages, the second being active balancing that ensures each cell reaches optimum charge. As no heat is generated in this mode by attempting to continue charging fully charged cells, no additional cooling is required. 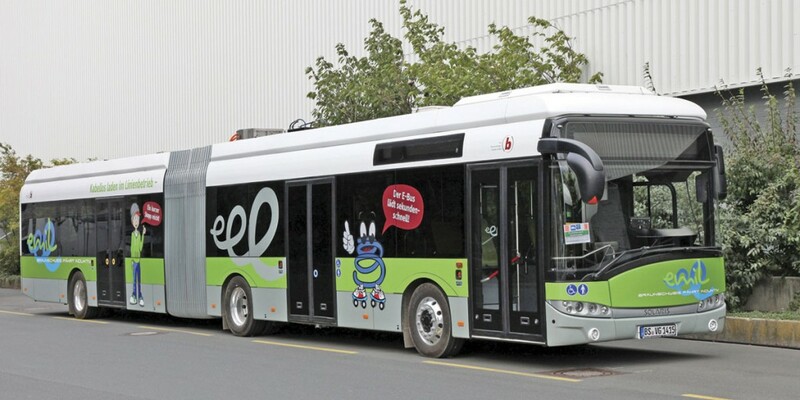 Braunschweig pioneered the use of induction charging with the introduction of a 12m Solaris E12 electric bus on circular route M19 in January 2014. The 200kW Bombardier Primove charging station was installed at the railway station terminus where power was available from the city’s tramway system. Induction charging was chosen for its minimal susceptibility to weather conditions and to avoid the need for the driver to leave the vehicle. The E12 was specified with a 60kWh water cooled battery, Konvekta CO2 heat pump heating and air conditioning, alloy wheels, 160kW electric motor and 36 seats. Extensive promotion of the project was carried out with the character Emil and his compatriots, wiry creatures called the ‘Induktiven’ explaining the benefits of electric inductive charging. The E12 basically proved the concept although it was in principle too small for the M19 which required articulated vehicles. Four of the latter, Solaris E18s to a similar concept but with 90 kWh battery capacity, 240kW electric motor and 52 seats (total capacity 146), were delivered in late 2014. The E12 had achieved 82% availability, consumed an average 1.68kWh/km and is now used on schoolbus work. The E18s are delivering consumption figures around 2.15kWh/km. The next development of the project will see an additional charging station installed at the railway station enabling a future six vehicle operation. A key learning point for future vehicles will be the separation of the vehicle and battery cooling systems. Two inductively charged Hess vehicles are operating on rnv’s intensive 9.4km urban route 63 in Mannheim which has only two to three minutes layover at each terminus. Six Bombardier Primove 200kW induction charging stations have therefore been installed along the route with additional charging facilities at the depot which the route passes. The vehicles have 60kWh battery capacity to minimise the effect on passenger capacity. Delivery of the project was delayed by technical issues in the installation of the charging points, particularly third party services, and by the time taken to gain TUV approval for passenger operation. For this, rnv needed to demonstrate that the charging stations had completed 72 hours satisfactory operation. With the vehicles proving very efficient in operation, it took 12,000km of test running to achieve this despite keeping the heating full on in summer! Passenger operation was introduced in June 2015 although some journeys remained diesel operated initially as the operator strived to match traffic delays with charging necessities. These have reduced but a one to one replacement has yet to be achieved on a regular basis. Problems with the vehicle induction plate not lifting after charging have required the recovery of vehicles three times although on investigation, two of these have been put down to mis-operation. A positive side benefit of electrification has been an improvement in drivers’ attitude to route 63, duties on which were previously disliked. Stuttgart has particular air quality problems due to its valley location and also strong expectations of its alternative fuelled vehicles. These must be able to run a full day on any route commensurate with their size and have a minimum three days’ fuel requirement stored at the depot. They must also be capable of being driven by any driver and maintained by any of the engineering team. Since 2010, diesel-electric hybrids and fuel cell electrics have been introduced and all remain in regular service. Markus’ presentation focused on the unseen economics of hybrid operation including the need for driver and workshop staff training. He was particularly concerned with the latter as operators relied on manufacturers for vehicle specific training and needed reassurance that this training would still be available for new staff when the vehicles were approaching the end of their design life. There were also technical issues arising not related specifically to the hybrid componentry but impacted by the design changes from diesel vehicles. These included cracks in body components as a result of different loads and forces and corrosion from the build up of salt and leaf mulch. Innovative fleets needed to meet availability targets but these needed to be set at sensible levels and the fleet sized correspondingly, for the current fuel cell fleet this could be as low as 60-70% given procurement delays for spare parts. It was important to have enough vehicles in service, ‘passengers don’t understand that innovation can have a negative effect on service quality.’ Politicians also needed to understand that routes converted to alternative fuels would normally be operated by them but not exclusively. Markus considered only hydrogen fuel cell vehicles could meet SSB’s future noise and emission targets and one of the fleet had attended COP21 in Paris. 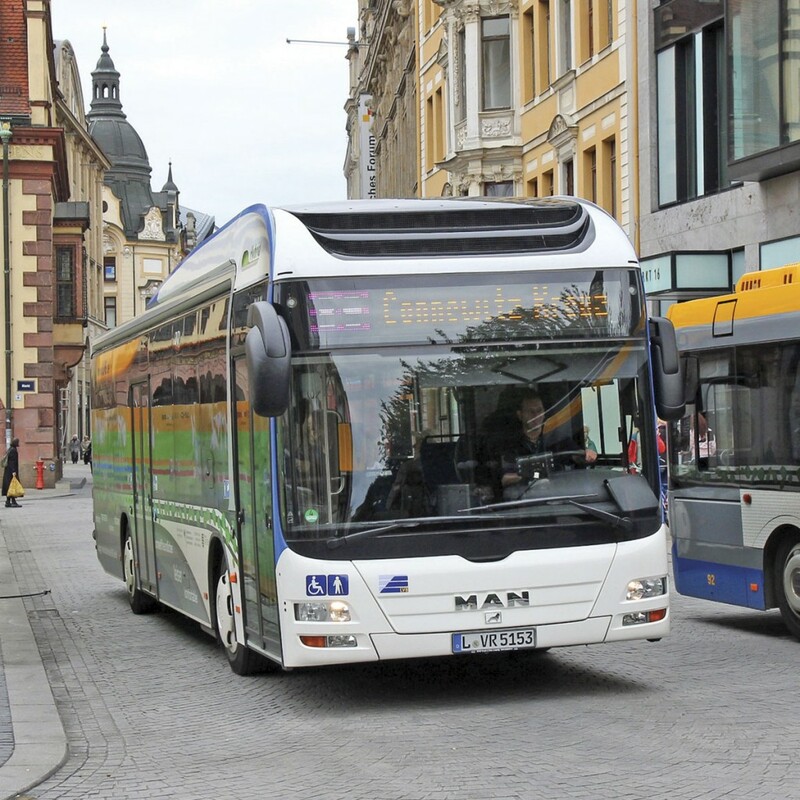 Hamburg has a target for only emission free buses to be purchased by 2020, which means 80-90 vehicles per year for HHA, hySolutions parent company, alone. To extensively test the current market, HHA is using its 10km route 109 as a live test bed. Trials started with a fleet of 25 Mercedes-Benz serial and Volvo parallel hybrid vehicles which have been joined by four Mercedes-Benz fuel cell vehicles, three Volvo plug in hybrids and two Solaris battery hybrids with fuel cell range extenders. Full electric Volvos will join the trial in 2016. The 109 is intended to give a first impression of how an electric future may look, although unlike many HHA routes it is worked standalone and can support plug in charging regimes allowing these vehicles to cover 70% of the route emission free. The trial has provided extensive opportunities to develop workshop experience and has emphasised the need for staff engagement. Significant work on the latter has been needed to improve the first time charging rates for the plug in vehicles. Hamburg is at the forefront of promoting the next Europe wide programme for hydrogen fuelled vehicles which would see 300-400 such vehicles in service, 140 in Germany, and the design of depots specifically for them including hydrogen storage or production facilities. Two presentations provided a detailed analysis of Cologne’s proposal to electrify route 133 which links the railway station and cathedral with the southern cemetery, encompassing a number of sensitive environmental areas. 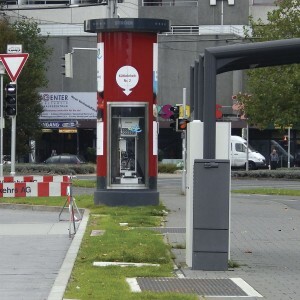 Both RheinEnergie and KVB are ultimately majority owned by the city of Cologne although the presentations brought out a number of issues with other city owned organisations in the placing of charging points and transformers. KVB chose not to use its existing tramway transformer substations as this could not only have led it to being declared an electric network operator giving third party connection rights but could have uncovered unexpected situations underground on the existing sites. RheinEnergie started in eMobility in 2009 and has built up a network of charging stations under the TANKE brand for its own vehicles, cars, bikes and even ships, moving from being a pure energy provider to a service provider in the process. Installing the 240kW rapid charging points proved a challenge with environmental objections, third party plant in the way and impacts on the capacity of the electric network. One charging point was provided at the city terminus with two at the outer terminus and a test point within the depot where individual 50kW charging stations around the depot perimeter are provided for overnight charging and battery balancing. 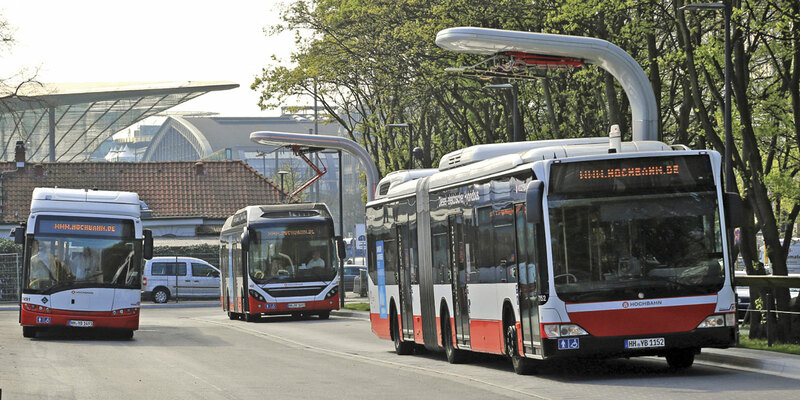 KVB ordered eight articulated electric buses from VDL for the project and worked closely with the manufacture. Particular attention was paid to achieving an attractive design which was strong but light in weight. KVB was concerned at the impact of weight distribution compared with a diesel vehicle so extra focus was placed on finite element analysis of the structure and the quality of welding in critical areas. Overall KVB consider VDL to be a good partner for the project. The vehicles have a 122kWh nickel-manganese-cobolt battery pack mounted at the rear offside and are designed for a minimum range of 30km at –20degrees meaning in the worst case they can do one journey and return to depot under their own power. Under normal circumstances a range of around 50km can be expected. The first vehicles have been delivered but KVB does not expect full electric operation to commence before December 2016. In the interim, there will be a wide ranging training programme covering not just traffic and engineering staff but also the control room team who will need to recognise early the development of situations where vehicles’ access to recharging is limited by traffic congestion. Each vehicle will be tested for compatibility with each charging station before the number in use is gradually increased to test a range of operational scenarios. Pauline’s presentation covered the progress of the ZeEUS project revealed at their recent London event which was reported on fully in Bus and Coach Buyer at the time. Irizar wished to position itself as one of the main partners for full city electrification and did not intend to be involved in hybrid vehicles. The group has recently acquired electric motor manufacturer Alconza, gaining relevant new expertise. The i2e has been designed from the outset as a full electric bus (including heating and cooling) meeting R66 rollover standards and, anticipating European 20tonne markets, offering a guaranteed range of 200-220km or 14-16 hours in operation. The development vehicle has successfully completed the equivalent of 600,000km or 12 years testing whilst pre production examples have been in service in San Sebastian and Barcelona since 2014, London’s examples followed in 2015. Consumption figures of 1.5kWh/km are being recorded with a mix of drivers and routes in San Sebastian, rising to 1.9kWh/km on a dedicated route in Barcelona where extensive use is made of the air conditioning system. Experience has shown that driver efficiency can impact by up to 30km on the daily range. Irizar’s commitment to electrification is being demonstrated by the creation of a new factory specifically for the project, the development of depot and opportunity charging systems, the introduction of a BRT vehicle by early 2017 and the extension of the technology to other city vehicles. TM4 is a Canadian based multinational owned by the Hydro Quebec power company which also owns most patents to Lithium-Iron-Phosphate batteries. TM4 produce the SUMO range of electrical equipment for hybrid vehicles used by companies including Volvo, Foton and Novabus. The conference centre foyer hosted display stands from many of the organisations participating in the conference including Siemens, Ziehl-Abegg, DVB and the TU Dresden where a close inspection of the prototype composite wheel was possible. Outside, five vehicles were available for inspection and demonstration. The Fraunhofer Institute has recently acquired a new demonstration vehicle, a Hess Swiss-Hybrid articulated former demonstrator that has been converted for plug in virtual electric operation with a Schunk pantograph. Ziehl-Abegg showed their current VDL Citea based development vehicle. A short ride on this confirmed its extremely smooth and quiet operation with insignificant noise levels from ancillary equipment. Bozankaya showed its 12m Sileo demonstration vehicle that had travelled from Salzgitter with one recharge en route. Two DVB vehicles completed the display; the Mercedes-Benz Citaro articulated hybrid being used for development work with TU Dresden on route 64 and the Solaris E12 from route 79. Following closure of the formal conference business, delegates were given the opportunity to sample the DVB Solaris E12 and witness it couple to the charging station at the route 79 terminus in Mickten. It was a popular offer and two well loaded tours were made. The ease of alignment of the vehicle at the terminus and speed of deployment of the charging system were notable. Like its predecessor two years ago, this was a fascinating if somewhat strenuous conference with significant technical and operational content. The German focus on moving to full electric operations in whatever form came through strongly, tempered by the need to manage the expectations of all parties. This particularly applied to costs, timescales and reliability with common themes across many of the schemes presented. There was strong political support to move to electric vehicles but the infrastructure needed often met with unexpected local opposition and any project where digging up streets in urban areas was involved was guaranteed to unearth problems; anything from unrecorded third party plant through unexploded ordnance to Roman remains! By the next conference in 2017, the foothold of electric buses should be strongly established and the focus could well be on introducing electric bus fleets rather than individual routes.